PennsylvAsia: Kang gets first hit of Major League career. On Sunday, Jung-ho Kang (강정호) hit a single off Milwaukee's Kyle Lohse in the 7th inning. 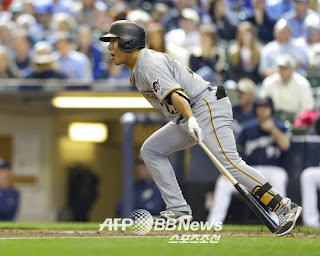 The hit was Kang's first in Major League Baseball, and made him the first Korean to record a hit in a Pittsburgh Pirates uniform. Kang is the second Korean to play for Pittsburgh in the regular season, following pitcher Chan-ho Park in 2010.